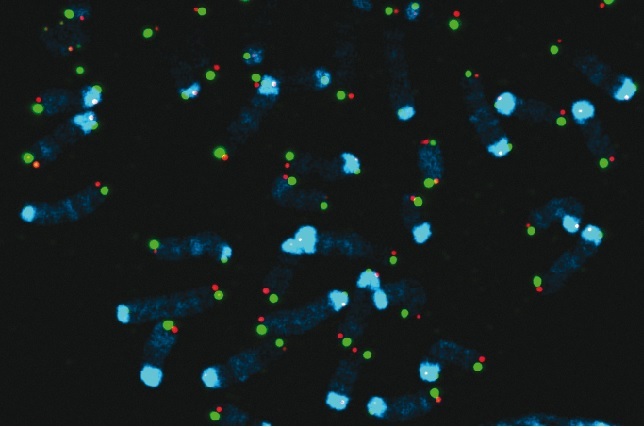 DNA is stained in blue, telomeres replicated by the leading strand machinery are stained in red while telomeres replicated by the lagging strand machinery are stained in green. The arrow points to a telomere sister exchange, where leading and lagging strand telomeres have exchanged sequences by recombination. This phenomenon is active and underlies the Alternative Lengthening of Telomeres pathway. Jérôme Déjardin and his research group are investigating how the ‘non coding’ fraction of the genome is controlled by specialized proteins known as heterochromatin factors. More than half of our genome is made of repetitive DNA which does not contain genes. Yet this fraction of the genome plays important roles, as any defect in its regulation can drive genome instability, premature aging, or cancer. They use mouse primary cell lines to study these questions. A large fraction of the eukaryotic genome is assembled into a dense structure in which DNA based processes are constrained. Regions that remain condensed at all times are usually gene poor and assemble into a state of chromatin termed constitutive heterochromatin. In most eukaryotes, constitutive heterochromatin is typically located in chromosomal regions adjacent to telomeres and centromeres. Both regions are made of repetitive DNA motifs (satellites) and are tightly controlled to maintain chromosomal stability. DNA methylation at cytosines and tri-methylation of Histone H3 on Lysine 9 (H3K9me3) are typical epigenetic signatures of mammalian constitutive heterochromatin. Both marks are installed by two enzymatic systems which intersect to enforce compaction: DNA methyl transferases, and Histone 3 lysine 9 methyl transferases. By recruiting specific protein machineries, these two marks define the nature and biological features of heterochromatin. My laboratory focuses on deciphering the pathways establishing and maintaining heterochromatin at telomeres, at pericentromeres and at endogenous retroviruses, and how these pathways are corrupted in aging and diseases, in particular in cancer. Our long term goal is to understand at the molecular level, how heterochromatic activities act to ensure genome maintenance and to control gene expression. • 2004-2009 Postdoctoral fellow, Harvard Medical School and Massachusetts General Hospital, Boston, USA, Bob Kingston’s lab. • 2009-2015 Appointed Junior Group Leader (INSERM CR1, permanent position) Research associate (CNRS CR, permanent position), IGH Montpellier, France. 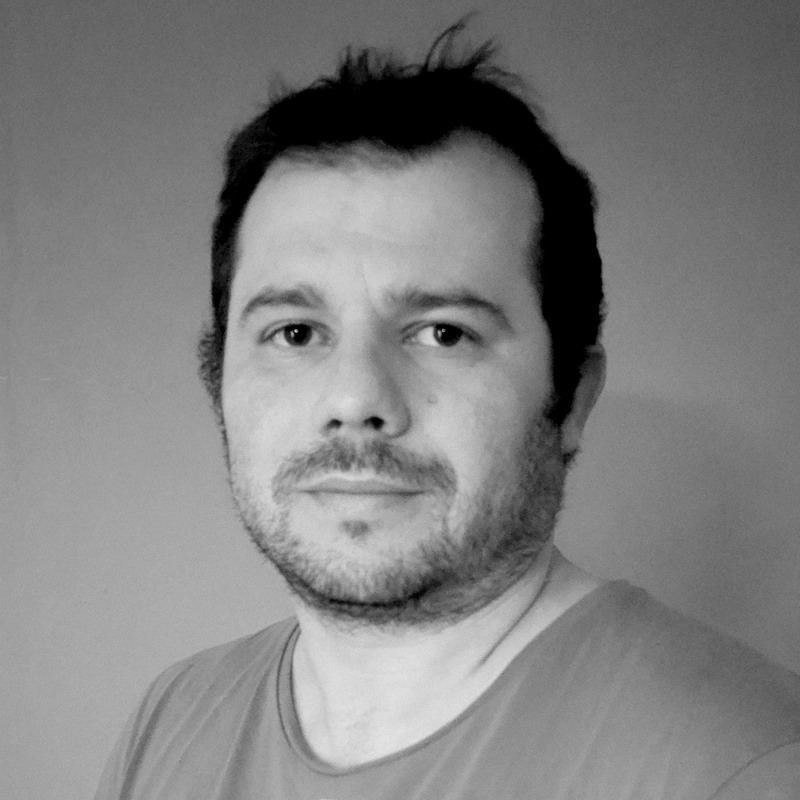 • 2015-present Appointed Senior Group Leader (INSERM, DR2 permanent position), IGH Montpellier, France.